I allow myself the freedom to imagine fantasy worlds of equality, peace, tolerance and understanding. My paintings depict a vision of idealistic communities, representing how life could be. 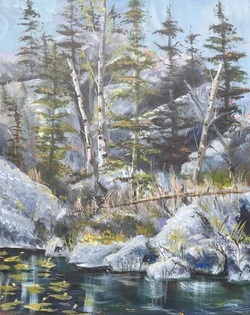 I am inspired by a positive response to the negative trends in today's world, My work has been exhibited in solo and group shows throughout Manitoba and is has been supported by the Manitoba Arts Council. If your interested in anything you might see here, feel free to contact me.